New York’s Penn Station, the busiest station in the Americas, is a congested, uninviting, and dangerous underground complex. It needs to be transformed into an expansive and gracious hub for an expanding rail network. Current plans to expand the station complex with a new Moynihan Station across Eighth Avenue and Penn South—a terminus for the proposed Gateway tunnels—should be enlarged to create a unified complex with room for more people and trains, through-running service for both commuter and intercity rail service, and an inspiring design that brings in light and air and pedestrian spaces. Madison Square Garden will need to be relocated to improve security and bring light and air into the terminal. Long reviled for its cramped conditions and uninspiring design, Penn Station has become increasingly dysfunctional, as ridership into the station has nearly tripled in the last 25 years—a level of use never contemplated by the station’s architects. Concourses and platforms are narrow, and vertical circulation to the platforms is inadequate. The station lacks basic amenities like clear signage and comfortable waiting areas. With no natural daylight or other obvious visual markers, it’s easy to get lost. The station also has little to no presence from the street, and pedestrian conditions surrounding Penn are poor. These problems will be further compounded in the future, as travel across the river increases in the coming decades. Work trips alone are projected to increase by 24 percent or more by 2040, depending on growth in all trans-Hudson travel and the amount of new rail service that connects to the station. New York’s Penn Station is already a vast complex that extends over two square blocks and three underground levels. In 2020, a new train hall in the Farley Post Office building will be added to this complex, a project known as Moynihan Station. And the Gateway project, currently in the planning stages, will further extend Penn Station southward. These investments will expand the station’s footprint, relieving congestion and finally providing the opportunity to gut-renovate Penn Station. Penn Station deserves to have a great presence in Midtown Manhattan. Today’s main entrance at 32nd Street is cramped and unwelcoming; it should be widened and expanded. A new great entrance to the station should also be built on the corner of Seventh Avenue and 33rd Street by turning part of 33rd street into a civic plaza. With new architectural elements running from 31st to 34th Street, Penn Station could also have an improved, uniform presence at the street level along three city blocks. Underground, there are also great opportunities to improve pedestrian conditions, even without removing Two Penn Plaza and its myriad vertical columns through the station. The Long Island Rail Road concourse, which runs under 33rd Street, should be widened and shifted north. Ceilings should be elevated for better light and air. The Hilton Corridor under 32nd Street should also be widened and extended eastward to connect Penn Station with the subways at Broadway and Sixth Avenue. Finally, the central concourse should also be widened and extended southward to connect to Track One (and later to Penn South), removing the B-level (Amtrak waiting room level) under Two Penn Plaza and lining up the NJT concourse with elevation at the A-level (the same level as the LIRR concourse). A new train hall in the Farley Post Office is under construction and should be completed by 2020. Moynihan Station, as the train hall will be called, will accommodate Amtrak’s main waiting room, its Acela lounge, and many of its back-office functions, freeing up valuable space at the existing Penn Station. The project’s completion should proceed without delay, including a new mid-block passageway to Ninth Avenue. Madison Square Garden’s 10-year special permit is up for renewal in 2023. It should not be renewed. By removing the sports arena and theater, Penn Station’s underground complex will gain much-needed natural light and air, and significantly improve pedestrian circulation and safety. Previous schemes have suggested replacing Madison Square Garden with a new head house with retail and office space. A recent proposal instead envisioned removing the floors of the arena and its exterior curtain wall, but keeping its structural skeleton and cladding it in glass. Combined with removing one of Penn Station’s underground concourses (on the B-level), this would eliminate over 200 columns from the platforms—freeing up significant space for pedestrian circulation, including stairs and escalators. Amtrak should move forward with this scheme. The building’s glass curtain wall should be open at street level to provide 360-degree access to the station, and the 33rd Street plaza described above should be extended to Eighth Avenue. Only the station’s three north/south concourses and two or three east/west corridors should remain to better distribute passengers, facilitate orientation, and better integrate the station with the future Penn South. A proposal by Vishaan Chakrabarti and PAU envisions gutting Madison Square Garden, removing the floors and exterior curtain wall, and keeping just the structural skeleton of the building clad in glass. This intervention, combined with the complete removal of the B-level concourse beneath MSG, would eliminate over 200 columns from the platforms — freeing up more space for stairs and passenger queuing, and removing all of the barriers between the tracks and platforms. The glass curtain wall would be open at street level to provide 360° access to the station, similar to many traditional stations. As part of its Gateway proposal to build two new rail tunnels under the Hudson River, Amtrak has been studying extending Penn Station southward, down to 30th Street. The most recent proposal is for a new station, named Penn South, with five platforms and eight tracks, four of which could be extended to Queens in the future. A far better scheme would be to build the station for through-running trains from the get-go. Because running trains straight through the station is so much more efficient than having trains terminate at Penn and turn around, fewer tracks and wider platforms could be built, while still accommodating up to 33 trains per hour. In fact, Penn South as is currently proposed—with four stub-end tracks and five platforms of varying widths—would make it much more difficult to retrofit the station into through-running in the future. Instead, the Gateway tunnels to New Jersey should be extended to Sunnyside Yards, with two new tunnels and an intermediary station at Third Avenue. To facilitate pedestrian circulation in Penn South, a new underground east-west concourse should be built, roughly between 30th and 31st Street, bookending the improved LIRR east-west concourse at the northern edge of the station. Widen select platforms in the center and southern end of Penn Station. This would result in the removal of a number of tracks. Replace escalators with stairs and elevators on the more narrow platforms to allow for greater vertical capacity. 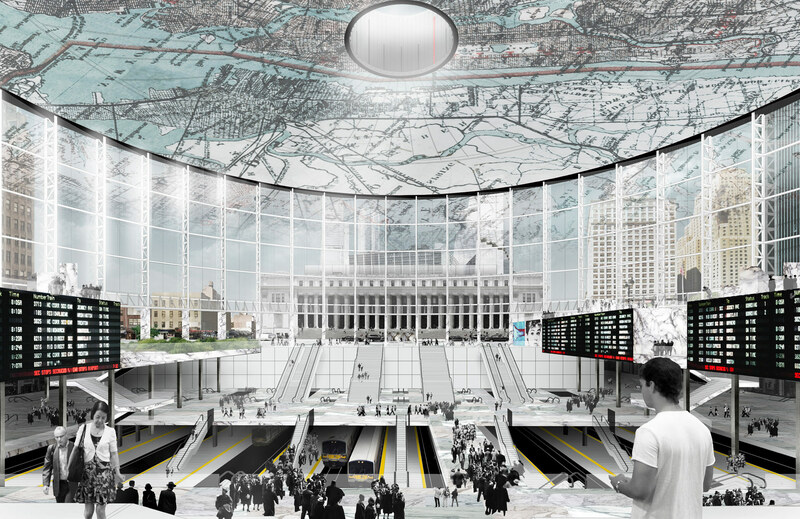 Simplify the station and improve vertical circulation by removing one of Penn Station’s underground levels and creating a more straightforward circulation scheme for the other level across the entire station complex. Remove as many old columns (from the original Penn Station) and other non-essential platform elements as possible to increase existing platform capacity. Install high-density signaling system in East River tunnels to increase their capacity and improve the reliability of the service. When I go into Penn Station I can't for the life of me figure out where to go, and I've lived in New York for a decade. The result of these investments and reconstruction would be a unified Penn Station complex with modern amenities and the capacity to serve a growing region. New York City and the region would finally have a station that reflects its status as a global economic hub and gateway to the metropolitan region. Commuters, intercity passengers, and visitors would enjoy the conveniences of a modern transportation hub, arriving in a station that is no longer a dreary and unpleasant experience but a place to linger and enjoy. Much, if not all, of the costs for a new Penn Station should be paid for from the value of real estate development that will be created either directly, from air rights that are released, or indirectly, from increases in the value of existing buildings near the site that would benefit from proximity to a redesigned hub that attracts more travelers and becomes a destination itself. For example, moving Madison Square Garden could create more than two million square feet of additional development rights that could be used near the station.